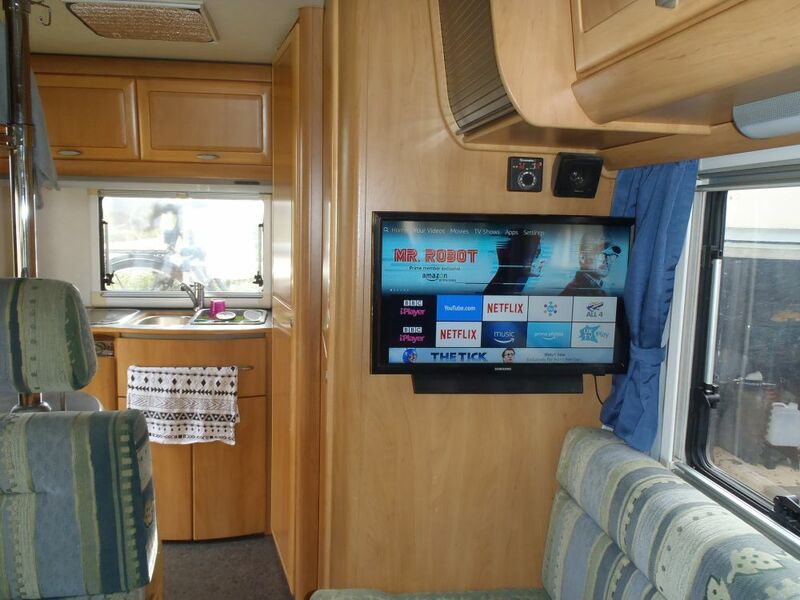 There a number of motorhome/caravan specific TVs available, but they tend to be expensive in comparison to typical domestic TVs and online reviews suggest a lot of them aren’t particularly high quality, so I decided to fit a standard domestic TV instead. 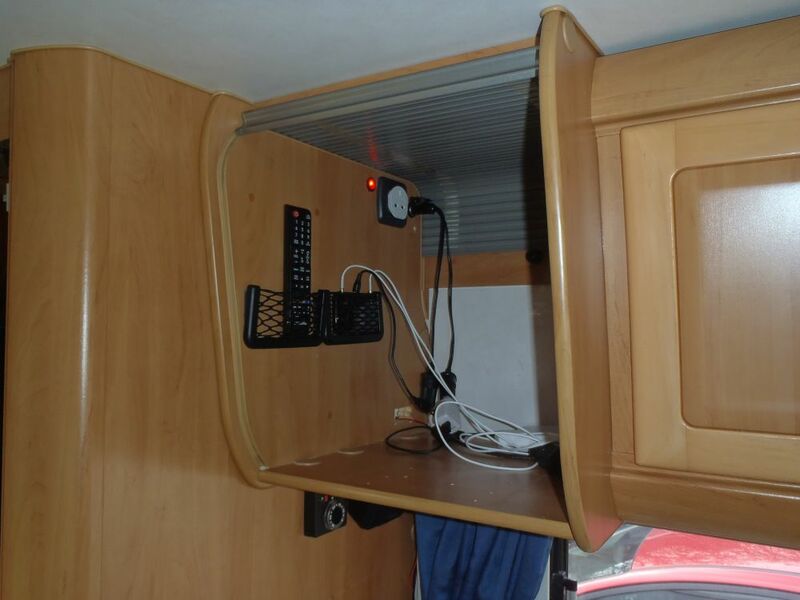 The main issue is finding a TV that will work on the 12V DC supplied by motorhome batteries, instead of the 240V AC domestic electricity supply. Fortunately a lot of the smaller LED TVs on the market come with external power supplies that convert high voltage AC to low voltage for the TV. I found a 24″ Samsung (model no. T24E310EX) available for £150 that works on 14V DC, but will operate quite happily on 12V. 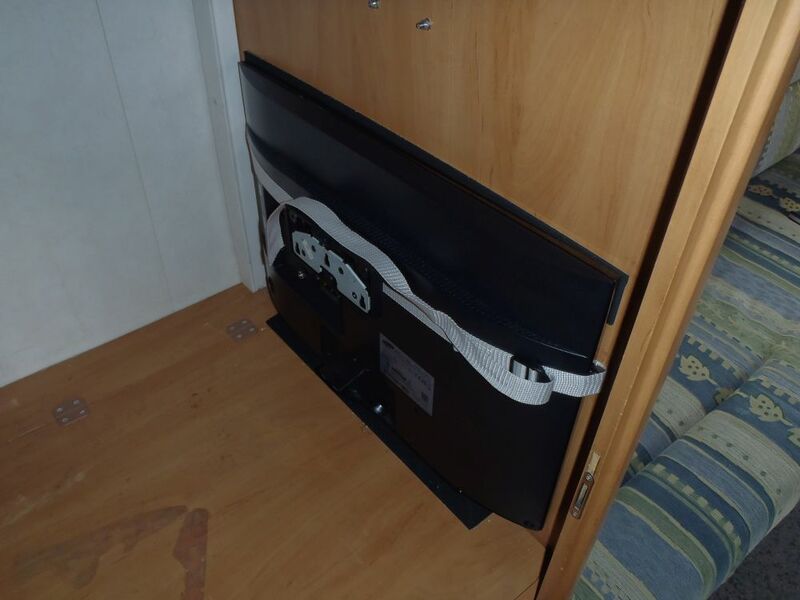 This TV comes with it’s own wall mount, and when using the wall mount the stand can be fitted to the bottom of the TV to direct the sound from the speakers out into the room. This does seem to work as the sound quality is pretty good, and small/mobile TVs often suffer from poor sound quality form the built in speakers. 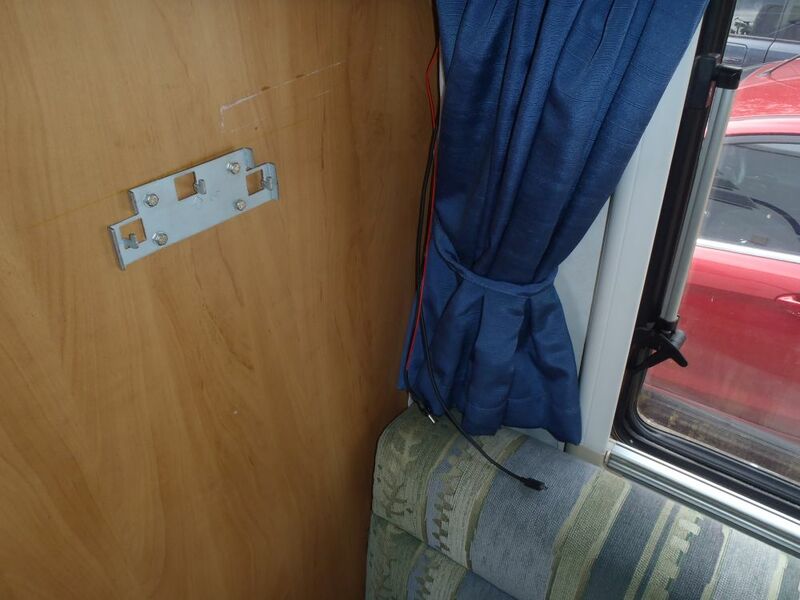 I added the rocker switch inside one of the cupboards and spliced the wiring into the supply for the 12V sockets in the bus. Having a switch allows you to turn the power off the the TV (to prevent any battery drain when you’re not using it) and having a illuminated switch makes it obvious when you’ve left it on. 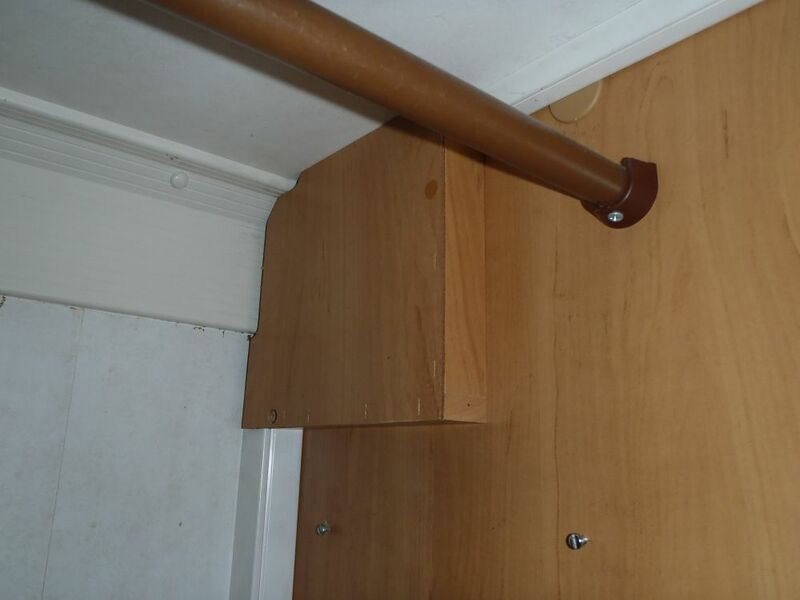 The wiring runs to the TV runs down through a hole drilled in the bottom of the cupboard. I’ve added a USB lead as well to power a Fire TV stick. In this photo you can also see the wall mount that comes with the Samsung TV, bolted to the outside of the wardrobe wall. This mount however isn’t designed for holding a TV in a bus bouncing down the road, so I needed to come up with a stowage solution. 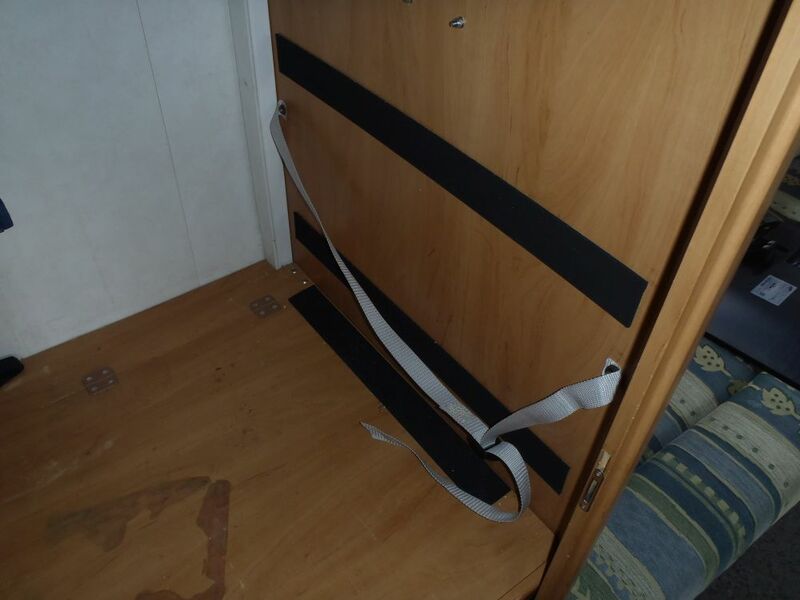 The wardrobe itself is just the right size so I fitted strap to hold the TV and some neoprene tape to add a bit of cushioning and prevent the TV getting scratched. Any comments/questions?, leave them below!